This article was originally written by Lura Jackson and published in the Calais Advertiser (www.thecalaisadvertiser.com) on March 10th, 2016. It is used with permission. Of the many brave and distinguished soldiers who have come from Calais over the past centuries to fight in wars both domestic and abroad, there is one that has received the highest commendation possible: the Medal of Honor. Horatio Nelson Young was only eighteen when he answered the call to battle during the American Civil War. Born in Calais on July 19th, 1845, Young was among the thousands of Maine soldiers that joined the Union cause. As the first state aligned with the new Republican platform, and with Abraham Lincoln choosing Mainer Hannibal Hamlin as his Vice President, soldier participation from the state was the highest per capita in all of the Union. Young traveled to Boston to join the United States Navy, and was soon assigned to the USS Lehigh. The Lehigh was a 200-foot long Passaic-class ironclad monitor, floating low in the water with its deck and pilothouse emerging from just above the surface. The Lehigh was part of the South Atlantic Blockading Squadron based off of Charleston Harbor in South Carolina, and summarily it engaged in frequent attacks against Fort Sumter. On one particular morning in mid-November, the Lehigh was at rest in the harbor and all seemed relatively quiet. Unfortunately for the ship and her crew, nearby Confederates at Fort Moultrie were the first to realize that the Lehigh had actually run aground in the harbor’s soft sands. Under the command of Captain Jacob Valentine, soldiers at Fort Moultrie proceeded to launch no less than 180 shots at the Lehigh, while soldiers at Battery Rutledge unleashed an additional 89 shots and 33 shells. Unable to free itself, the Lehigh had no options but to endure the barrage of fire from the enemy artillery. 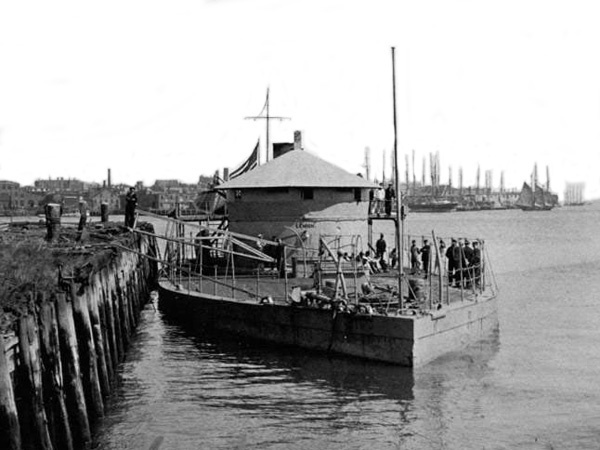 Three other monitors—the USS Nahant, Montauk, and Passaic—soon responded to offer aid to the Lehigh, or at least to distract the enemy gunners. Each of the three monitors unleashed heavy fire on the opposing forts, and were soon joined in by batteries at Morris Island. As the day progressed, concern mounted that the Lehigh would remain trapped past the point of high tide, leaving her open to be fired at for the remainder of the afternoon. Efforts to pass a rope to the Nahant by rowing a small boat between the ships were attempted multiple times. Twice they succeeded, but both times, a skilled Confederate shot the rope and broke it. Three crewmen—including Calais’ Young—tried a third time to row over to the Nahant and successfully create a lasting line, all while shells rained down around them. Even though no Confederate shot the line drawn by Young and his comrades, the rope strained, frayed, and nearly broke in the effort of moving the 1,335 ton vessel. Just before noon, the vessel was finally freed. “[Young’s] courageous action while under severe enemy fire enabled the Lehigh to be freed from her helpless position,” the presidential commendation for the Medal of Honor reads. To make a contribution, send a check with “Young Memorial” in the memo line to: St. Croix Historical Society, P.O. Box 242, Calais, ME 04619, or visit stcroixhistorical.com/?page_id=400 and click “Donate”.